Buy Tickets to the Great Debate! The 2016 Great American Think-Off live debate is this Saturday, June 11th at 7pm! Attend the live debate and cast your vote to help select America’s Greatest Thinker, and determine whether or not income inequality threatens democracy. 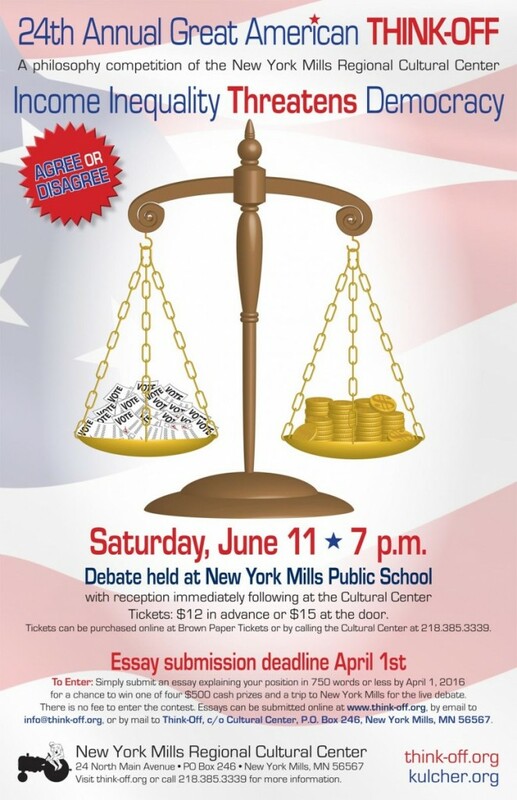 The debate will be held Saturday, June 11th, 2016 at 7:00 p.m. in the James W. Mann Center for the Performing Arts at the New York Mills School (209 Hayes Avenue). All are invited to a reception immediately following the debate at the Cultural Center (24 Main Avenue North, New York Mills). We will also have a mini parade on Saturday at 11:45am along Centennial 84 Drive, with the finalists riding through town pulled by a tractor, before the Ronald McDonald House Motorcycle Ride cruises through town shortly after noon. The Cultural Center would like to congratulate this year’s four finalists and ten honorable mentions, as well as thank all who have contributed to the planning of this 24th annual event. We look forward to a great weekend in New York Mills! Check back after Saturday to read the finalist and honorable mention essays in full. Need tickets? Click here to buy online on Brown Paper Tickets, or call the Center at 218-385-3339 to purchase over the phone. Discover Rescued Treasures in NYM April 13th! Comedian C. Willi Myles brings humor to NYM, MN!